How To Find The Best Herb Grinder! This blog post was created to help you decide which herb grinder to choose from. With so many on the market, it can be very difficult to find what you need, especially when most of them look the same with subtle differences. Grinders are commonly made of acrylic, plastic, wood, metal and electric. Out of all the herb grinders we’ve used and tested the diamond grinder was the best in all areas. Here’s the things we checked out; Quality is important because we want these things to last and not break from continuous use. A well-made grinder with a good number of teeth or pin strategically placed in the right spots should produce great results. This also goes back to the quality we have found that hand crank or electric grinder usually do a poor job or grind your marijuana way too much. These electronic units also don’t offer enough control and the quality is usually bad within all of them. Besides, at the end of the day, you really need electricity to work those units. Price is something to consider heavily because you could spend 40 to 75 bucks on a grinder that has the same results as a $12 product. The material is really the first thing we look into because believe it or not most grinders can make you sick! Which is why safety is on a list. Wood grinders have a finish both on the inside and also on the outside the same goes for all metal grinders. The majority are made of aluminum. Remember that aluminum pipe craze? Well, there’s a reason that they got replaced by glass. Aluminum makes people really sick and it’s linked to diseases like Alzheimer’s. Aluminum will rub off on your herb and even just a little bit is very dangerous but since they’re so popular we kept them in our demonstration just for you. Now there are titanium grinders out there somewhere actually just aluminum titanium is very expensive and is commonly alloyed with aluminum so we recommend avoiding titanium as well. Acrylic plastic units are also dangerous because it off gases and if you ingested or inhaled it you can lead to health issues. Now you see why safety is so important extra features are a great added bonus to herb grinders that meet all the criteria above. These bonuses can be magnets to hold the product together. Storage compartments for excess herb or a keif catcher. Kief catchers are not really a great extra feature because most don’t work and even if you have one that works it takes a long time to collect enough. It’s like having a root beer float the ice cream on the side just taken away the benefit. So why do we like the diamond grinder so much? It’s made of high-density superior pharmaceutical grade polycarbonate polymer with food grade polypropylene lids including rhomboid pyramid teeth that cut the herb rather than tear and pull the herb like pins do plus its UV resistant so it will last a real long time after grinding. Your marijuana will be evenly ground and fluffy giving you the results you demand with an affordable price between $12 to $14. We’re pretty stoked because money is tight these days and medical grade polycarbonate does not produce gases like acrylic or other polycarbonate found on the market. The diamond grinder features two, one-inch neodymium or rare earth magnets on the inside of the two storage compartments that hold three and a half grams of weed each! By having the magnets behind the grinding surface, you get more teeth per square inch which is always an important factor when purchasing a dry herb grinder. So, as you can see across the board the diamond grinder is our herbal grinder of choice, well some of you may be saying “so what I don’t care about all this crap I just want one that works good” so we did some tests with commonly found grinders so you can be the judge! We got some pretty common products which consisted of one aluminum and three acrylic and put them against the diamond grinder. After grinding and grinding we noticed that this unit was just pushing the herb around and not grinding at all! You end up with chunks and it’s sticking inside the screen because it didn’t offer enough pins and the pins were spaced out too much. It was all so deep so there wasn’t a tight surface area to grind with as you can see the herb is really chunky. The screener also left pieces of plastic and herb that were almost undetected! This would’ve been totally dangerous to smoke this red acrylic grinder has nice rhomboid teeth but because the magnets are in the center the herb just sat in the middle and wasn’t touching the teeth to grind this is an extra feature could end up ruining the results. 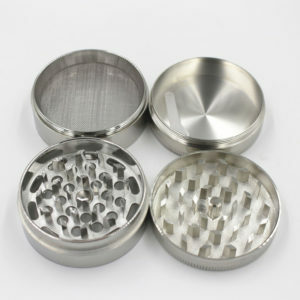 This aluminum grinder was not too bad but remember aluminum will rub off onto your herb and it only takes a little bit of aluminum in a short time to feel symptoms related to health problems, plus, this kind is still left chunks to because of not enough pins! We took the magnets diamond grinders you can see how the teeth cover a lot of surface area and really grind up their best. The teeth cut and break up the herb rather than push and pull the direction of the rhomboid teeth which helps to distribute them evenly. It moves throughout the grinder which gives the herbs a nice even grind leaving fully particles instead of squished weed. This will drastically decrease the chance of a sideburn or runner in a joint because your bud will be equally dense throughout your joint and it’ll burn like a fine Cuban cigar! We hope you enjoyed our article on how to choose the best dry herb grinder. If you need any further help finding a unit suitable for your needs please feel free to contact us.